A new twist to what THANKSGIVING is all about. This is the time of the year when we are often beginning to focus on the act of giving Thanks. Usually, for some they are thankful for the piles of food they are about to eat. Others are thankful for all the good things in their lives and for others they are thankful for all the good people in their lives, or a combination of the three. Thanksgiving was originally a celebration of the good harvest of the year, and therefore the celebration of things, which guaranteed they could eat during the winter and survive. Since most of us don’t plant our own food, the Holiday has evolved into many giving thanks for food, but for material things like roofs over our heads, and cars, and maybe Xboxes. Some extend the giving of thanks to the people in their lives whom they love and who love them back. Usually, this is as far as most people go. For years, I have encouraged my clients to find even more reasons to be thankful, especially at Thanksgiving, when they are inspired to do so. The result has been more people giving thanks for the good things that have occurred in their lives. For those who have not thought about including their thanks beyond what they have and who they have in their lives, this would be a good exercise and experience for many to incorporate into this year’s Thanksgiving celebration. Happily, many of my friends and clients now incorporate this kind of practice not only on Thanksgiving Day, once a year, but as many times a year as possible. In my case, I choose to do it every day, and on occasion, many times in one day, in some way or another. And for those of us who are ready to take THANKSGIVING to a whole new level, this year I propose a twist that took me years to discover, but that has become a part of my life and my teachings for over fifteen years. Years ago, I began to see how every single thing I had ever judged as bad, horrible and/or just plain wrong had actually served me and had helped me become who I am today. After all the work that I have done, coupled with all the things that were “bad,” in my life, I have the wisdom to know that ALL of it has made me who I am. In my private session and workshops, I share with my clients’ story after story that illustrates the difficulties I have gone through in various times in my life and how hind sight proved that the difficulties proved to be opportunities. Even the experiences in which I thought my life was over, proved to be moments in which my life was truly about to begin in a new more improved way. And though life can continue to throw me a challenge here and there, as it does all of us, I know enough to know that this moment has a gift and a lesson. 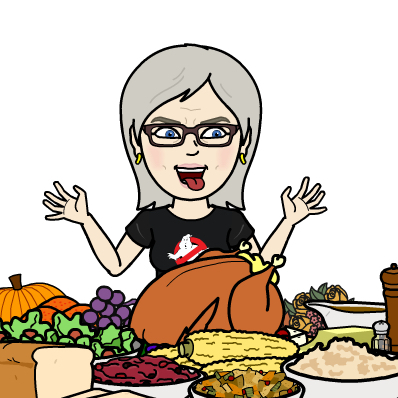 So, my THANKSGIVING Twist is not just giving thanks for what we have, and who we have in our lives, and not just for all the good that has happened to us, but for all the bad as well. Because only embracing all of who we are can we truly be in this moment. And only in this moment can the miracle of our lives unfold.